Corporate entertainment is always a sound investment. Why? Because good business is about personal relationships. People doing business together do it better if they feel comfortable with each other. Which means they need to know each other better. Clay pigeon shooting provides that opportunity in a unique way. A shotgun certificate is not needed whilst under our supervision. The sport caters for absolute beginners and the most expert. Clients and hosts shoot together, which means they socialise and share the experience. This process continues over the sporting lunch and possibly dinner in the evening. At Mendip Shooting Ground you, and the people you do business with, share a day outdoors on 100 acres of the Mendip Hills in an area of outstanding natural beauty. Lunch at the local pub means a country pub that serves an honest pint and good, wholesome food without 'musak'. Corporate entertaining won't bring you any business that you don't deserve, but it will get you closer to the person who can. Phone - or E-Mail us - to discuss how we might be of service to you - or come on over and visit us. A warm welcome is guaranteed. For Corporate details please contact Vernon & Liz 01749 673471. 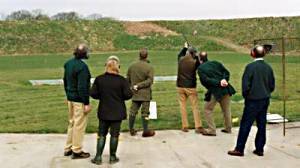 Archery and Air Rifle Shooting also available (for further details please see Archery or Air Rifle Shooting).